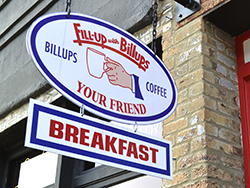 "Fill-Up with Billups" restaurants, in Oxford and Biloxi, feature original graphics from the Billups service stations and a 1950s retro diner theme. A new location opens soon in Madison. There was a time when the “Fill-Up with Billups” slogan adorned highways throughout the southern states. With over 600 Billups Petroleum service stations spanning across eight states from Florida to Texas, the Billups family made quite a name for themselves during a time when two world wars and the Great Depression hit hard most of the people living in the United States. The company that began in 1927 and grew over the next 36 years, until it was sold to other proprietors in 1963, was founded by Rowell Billups when he built a full-service gas station in Carrolton, Miss. The station had two pumps, premium and ethyl. As the company expanded, Billups’ brothers, Guy Billups Sr. and Buddy Billups, became involved with the enterprise and the Fill-Up with Billups name grew exponentially. The headquarters office was moved to Greenwood and Buddy Billups moved to Hammond, La., launching Billups Eastern. Guy Sr. went to Louisiana with his brother and worked with him there. Eventually, as the story goes, they became the No. 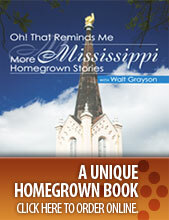 1 independent oil company in the nation and were the first successful oil company from the south. In 1963, the brothers sold the company to Exxon, Citco and Charter Marketing. Guy Billups III remembers a time as a young boy when the service stations were still operated by his family. When they sold the company, they gave each manager the opportunity to buy their store. Many of these managers, mostly in Mississippi and Louisiana, took the family up on the offer, so Billups stations actually continued to operate as independently owned stores well into the 1980s. The Billups family was known for their service and effective marketing approach. They found it important to check customers’ air in their tires, check fluids in the engine, offer specialty items inside the stores and send customers on their way with a full tank of gas. It was full service, certainly a thing of the past. After working in the automotive sales industry and banking for most of his career, Guy knew he would one day honor the legacy of his family. “I didn’t particularly want to do the same thing that they did, but I always knew Fill-Up with Billups would work again in some fashion,” he said. When he began the process of acquiring the trademark, he had to prove to himself that he could sell a product first. That’s when Guy and his wife, Hattie, began a small coffee company in Oxford named Fill-Up with Billups in 2014. In a surprising discovery, the Fill-Up with Billups name was never trademarked, and Guy hit the jackpot when he realized the name was not sold along with his family’s service stations. After procuring the trademark, he was free to resume the Fill-Up with Billups legacy. In October 2017, Guy and Hattie partnered with longtime friends from south Mississippi—brothers Jordan, Field and Lloyd Nicaud and their parents, Kent and Jenny Nicaud—to start a restaurant project on the courthouse square in Oxford. The Nicauds are well aware of the dedication it takes to run a restaurant; they are the owners of the Bacchus restaurants statewide. When Bacchus moved into the old Rowdy Rebs location on the square, it seemed a perfect time to launch the Fill-Up with Billups diner project. In March 2018, Fill-Up with Billups opened in Biloxi with the same ‘50s diner theme. Guy dreams of expanding it as far as it will go, with possible future locations in Hammond, La., and Jackson. The idea is to recreate the Billups name. The restaurant was not designed for Guy to be present daily. He charges Susan Coley with that responsibility. Coley has worked for the Nicaud’s for many years and as the general manager, she manages the day-to-day operations. Guy does like to visit often, however, and enjoys visiting the customers. He has a genuine interest in those who visit the restaurants. “What’s really been interesting is that the elder people remember the Billups service stations and the college students question it. They want to know where the service stations are, so then I get to talk to them about the story. So there’s a whole new generation now that is learning about history right here from Mississippi. It was a huge success story and it was always important for me to push that narrative,” Guy said. Fill-Up with Billups restaurants are located at 1107 Jackson Ave. E. in Oxford and 100 Caillavet St. in Biloxi. The third location opens this month in Madison. Learn more at FillupwithBillups.com.